Manmohan Singh condoled the death of A.P.J Abdul Kalam, saying he "greatly benefited from his advice as president of the country". 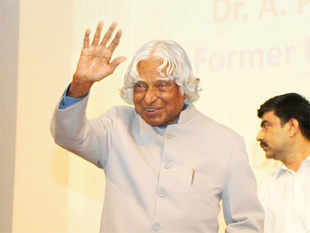 NEW DELHI: Former prime minister Manmohan Singh on Monday condoled the death of A.P.J Abdul Kalam, saying he "greatly benefited from his advice as president of the country". "I have learnt with profound sorrow about the demise of Dr. A.P.J. Abdul Kalam. In his death, our country has lost a great human being who made phenomenal contribution to the promotion of self reliance in defence technologies. "I worked very closely with Dr. Kalam as prime minister and I greatly benefited from his advice as president of our country. His life and work will be remembered for generations to come," Manmohan Singh said in a statement. Kalam, who was India's president from 2002 to 2007, died in a Shillong hospital. He was delivering a lecture at the IIM-Shillong when he suddenly collapsed, officials said. Doctors said Kalam suffered cardiac arrest. Has the missing MH370 plane wreckage been found?